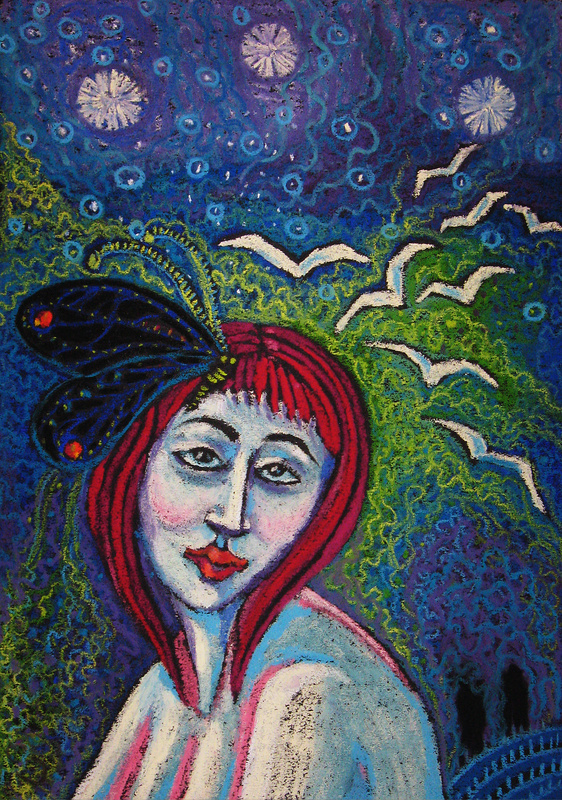 My poem was inspired by the painting: ‘Life-Secret 1: The Black Butterfly of Inspiration’ by Caroline Ireland, which I viewed during Bridport Open Studios event. See the image below. I visited the start of Bridport & W.Dorset Open Studios a couple of weeks ago and viewed some gorgeous art. The Open Studios project is part of Bridport’s Festival of Culture and it will be continuing over the August bank holiday weekend. I viewed some paintings by David Brooke, Caroline Ireland and Kit Glaisyer – all very different and all so very inspiring. They were so inspiring that I’ve written poems about specific artworks. These, together with poems by other poets, may well be displayed alongside the works of art. So – if you need some inspiration for your writing – visit Bridport! Last week, Wimborne Writing Group visited Priest’s House Museum in Wimborne. This was our summer outing. We were given a guided tour and interesting talk, then coffee and delicious cakes in the brand new cafe and conference centre. The gardens which stretch down to the river are beautiful and had it been a sunnier day, I’m sure we would have sat outside. Each room at the museum is in a different period and figures dressed in clothes of the time bring a real-life quality. Our guide read a letter to us that Mrs Susan Lowe received in 1829 from her husband, William, when he was away on business. When he returned he brought her a magnificent lustre jug as a present and this is in the museum. It made me think again of how letters are invaluable for historians. Our texts, emails and phone calls are ephemeral and won’t provide the same sort of record of ordinary lives for historians of the future. Think, also, about the important role that letters have played in plays, novels and poetry.